Ever heard of illyngophobia? It is the fear of looking down that might cause dizziness or vertigo. Unlike, Acrophobia it does not mean that you're afraid of heights. It's just that once you're high, you are scared of what might happen next. Take roller coasters for instance. The tricky part is not going up. But it is what will happen on the way down. Something similar is happening to investors in the stock market at this moment. Up until 2018, the stock market roller coaster was on a one way ride up. There was no fear of heights. But since then, the downward ride has been unable to bear for many. If you believe social media and the newspapers though, the ride has just started. With elections around the corner, the volatility is expected to get worse. What does the past say though? There was similar scare mongering around 2014. Fears of a fractured mandate at the centre ran high. No clear majority, stalling of India's growth and various other issues were doing the rounds. As usual, people were advised to stay away markets till the election outcome was clear. But did the Sensex do at that time? It did what it always does. It surprised us. In the 6-month period prior to the 2014 general elections, the BSE Sensex went up 16.7%. And the 1 year return was even better, 37.5%. People who felt they could time the market didn't make any money. It's like wanting to get out at the top of a roller coaster. This is not possible. Does that mean we can expect similar returns in the upcoming elections and blindly buy any stock? It might indeed be a volatile ride. If you're on a downward ride, instead of running for the exit, look at it as an opportunity. An opportunity to buy great safe stocks. Safe stocks will act as your seat belt and protect your portfolio in this volatile market. These stocks will allow you to come out of this ride safe and sound. Get started with my latest special report has contains the list of my top 7 stocks to buy now. A critical factor in the upcoming elections could be the jobless population of India. Governments, past and present, have continued to face challenges on the employment front. According to the latest CMIE data, the unemployment rate in India has shot up to 6.7% from 5.3% in June 2018. The upheaval in the unorganised sector has a lot to do with the increase in unemployment. Post GST and Notebandi, there has been a gradual shift from the unorganised to the organised sector. However, a majority of India's workforce is employed in the unorganised sector and they have been badly hit. The movement of this workforce in the organised sector has been slow. A big reason has been the lack of skilled employees. India faces a severe shortage of skilled workers who are in high demand in the organised sector. The challenge for the government will be to improve quality and quantity of the skilled workforce in the country. With the general elections due in May next year, this is easier said than done. Until then, you should protect your portfolio with select safe stocks. My latest report is all you need - 7 Stocks To Profit From This Market Crash. 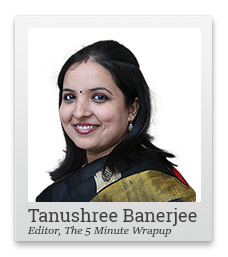 PS: Tanushree Banerjee is Equitymaster's co-head of research and editor of StockSelect She has a long and illustrious track record of picking safe stocks. For over 16 years, StockSelect subscribers have received safe stock recommendations that delivered double and triple digit gains. You can receive Tanushree's safe stock recommendations by signing up here. Equitymaster requests your view! Post a comment on "Before the State Election Results, Fasten Your Seatbelt". Click here!